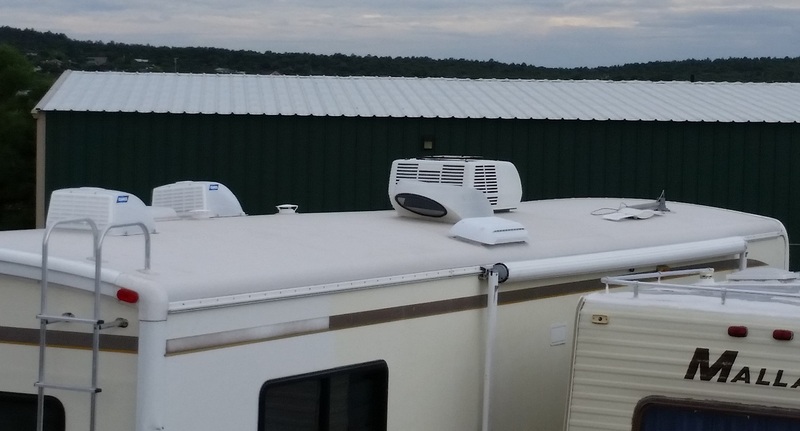 roof helping rack up some repair bills… – RV Cheaper! June 13, 2015 September 21, 2015 RV Cheaper! Back in April I noticed black streaks coming down from the roof along the sides of the RV. I got up on the roof and to my surprise the sun had burned through some of the white layer exposing the black rubber. I had been checking it pretty close and knew I better get prepared to put some new coating on the roof, but wow it started going downhill fast! 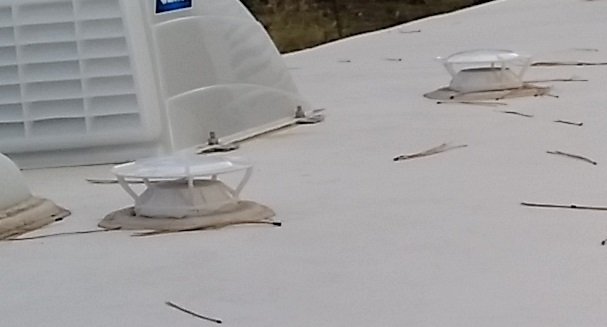 In fact, as I spent the latter part of April learning what kind of roof I had and how to re-coat it, the rubber deteriorated even more and I began seeing cracking to the point that I knew I would have leaks really soon. At this point I knew the rubber was too thin to re-coat, it would have torn away going down the highway I’m sure. I even started researching about peeling off the rubber roof and using the RV version of Kool Seal directly on the wood roof. I just couldn’t find enough information to have any confidence and Alice said she wanted to keep the Bounder several more years so lets just do it right. I started getting estimates and quickly found out how flaky some RV repair companies can be once I started calling back for appointments. I finally decided to get a new estimate from another local company. Considering how many billboards they have around the state, I skipped them for initial estimates as I didn’t think I wanted to pay a premium for their big advertising. But I was pleasantly surprised how competitive the quote was! Our destinations don’t require air conditioning, but our trip to Oregon last year made us realize the road trip sometimes makes it a requirement. Our A/C wasn’t running very cold once we got it to Arizona and from inspections I made I knew it it was on it’s last leg with severe rust from the gulf coast. Getting the A/C replaced while roof was being done would eliminate $300 in labor and they said they would not charge me for the leak checks if I ended up buying a new unit from them. After discussing plans A & B, Alice and I decided to take the Bounder to them. When we got there they had a mix of Class C and Class A RV’s getting new roofs and other renovations done under huge shade structures. The office had cabinet, flooring and upholstery samples so they must do some major renovations. My confidence was building some more. But then the shop foreman called me after inspection with a quote for the roof that was way off from what the owner gave me the week before. I told the foreman what I was quoted and he said it was too low even if there was no leak damage. He went and talked to the owner and he stood by the original quote (no doubt I would have cancelled if he had not honored the quote). Luckily the roof had no water damage yet, but we did end up with some other surprise expenses. I had some of the clearance lights burn out and once I lost four of them, the rest went very quickly. I assumed the remaining bulbs were getting too much juice with the other gone and burned out. But when they removed the trim and front/rear cowls to replace the roof, they found that the lenses had leaked and the moisture had corroded the internal connections really bad. They gave me all of our old parts so I have piece of mine about that work. So when it was all said and done, we had a new roof, new 15k BTU A/C unit, new clearance lights, new awning brackets, new fridge vent, two rain guards for the bedroom and bathroom vents and had them install the 360 Siphon RV Fume Extractors I bought on Amazon (86’d the stock sewer vents). I chose the low profile fume extractors instead of the Cyclone vents since we clip so many trees on the forest roads when we camp. I have no doubt I would lose the cyclones on the very next trip. Since I knew the wallet was going to be throbbing for a while, I asked about a new furnace motor and was pleased with parts and labor for that and it was squealing too loud for anyone within 50 feet to sleep. Last, I asked about price to replace some broken latches on a basement door. After seeing how it was done, I know I can do the others myself in the future. New low profile 360 Siphon RV Fume Extractors from Amazon, they definitely help on the road and when parked. You can see we cleaned quite a few branches off the pine trees on our first trip. A metal version of these should be standard equipment! Despite the hit to our savings for all that work, I’m very pleased with the quality of work and I didn’t find anything needing tweaks. When I was in Bend last month, I saw my nieces neighbor had a 98-99 Bounder and despite the cooler, cloudier Oregon climate, his roof looked much like mine. Seeing that other Bounder was when I accepted that our roof was ready to be replaced and not just re-coated. I’m really curious how many years our roof had been there, I can’t imagine it’s the original but that other Bounder I saw has me wondering if maybe ours had survived those 16 years. If we have not been as happy as we are with this coach on our vacations and camping, we couldn’t have put that much money into it. I was even more surprised Alice wanted to put that much into an Ebay special! But this latest repair certainly gives us the confidence to keep it a few more years as we finalize our wish list for a full time quality RV.